Do you know how many watts general appliances use? We are getting an increasing number of call-outs for faulty electrical supply via our bollards. The clear majority of these are either due to overloading of the supply, a faulty cable or a fault in the boat itself. If you are an experienced boater we are sure you will be aware of the limits for the power that can be drawn at any one time via the bollard, but as a reminder to all this is how it works out. As the voltage is allowed to fluctuate the supply may sometimes be less than 230, so a safe maximum figure to work to is 3,500 watts maximum at any one time. 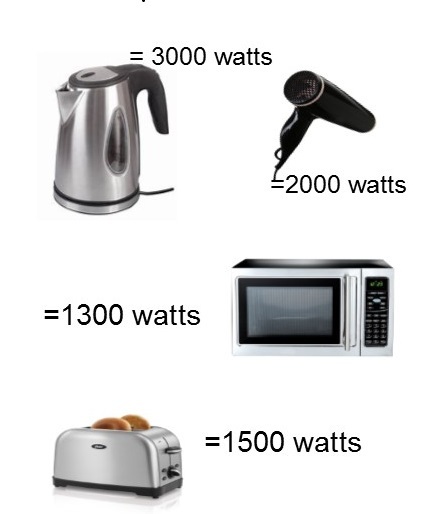 To put this into perspective, an average domestic kettle is rated at 3000 watts, a microwave could be 1,300 watts and a toaster could be 1,500 watts. 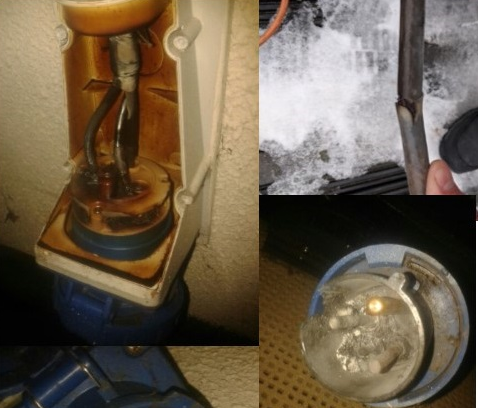 So, careful management of appliance use is needed to avoid tripping the MCB in the bollard, excessive tripping over a period can lead to premature failure of the MCB, so it is important not to rely on the MCB to regulate electricity usage. These cables must never be jointed, and the use of “splitters” from a bollard is not allowed. If an RCD does trip, please perform a few simple tests yourself to ensure where the problem has arisen, then reset the RCD. If it trips again then there is still a fault present. Firstly, disconnect the cable from the bollard and boat and give the connectors a shake to remove any water, 90% of the problems we have are due to water ingress in either the plug or socket on the connecting cable. Before reconnecting the cable to the bollard and the boat reset the RCD and check that there is a green LED lit on the meter. At this stage if the RCD does not trip and the meter LED stays green then the is almost certainly a fault with the cable or the boat. Next connect the cable at the bollard only and log back into the system and turn the power on. If the RCD trips immediately then there is a fault with the cable, if the RCD does not trip then the fault is likely to be within the boat. If this is the case then switch off all the circuits on your boat distribution board, reconnect the cable and check the RCD again, if it says in switch on each circuit one by one until the RCD trips indicating that this circuit is at fault. In some instances, the fault may have cleared and nothing will be found (nuisance tripping). Please remember the RCD detects earth leakage faults and the fault may be within a faulty or damp appliance which may take time to re-occur. If a problem continues, do call us, we check and monitor the bollards centrally, and can often indicate what the problem may be. If we do call out an engineer, and the fault is not with our equipment, we will seek to re-charge the cost of the visit which costs circa £200 per visit. During 2017 we spent a considerable amount on call outs to electrical faults that were caused by the customers equipment. We do hope this brief guide will help you to maintain an efficient and constant electrical supply to your boat. As a provider we will seek to resolve a problem with an electrical supply as quickly as possible for all customers. A great many fixes can be made remotely by our support team during office hours over the telephone.